What is new in Rocky 4.2. 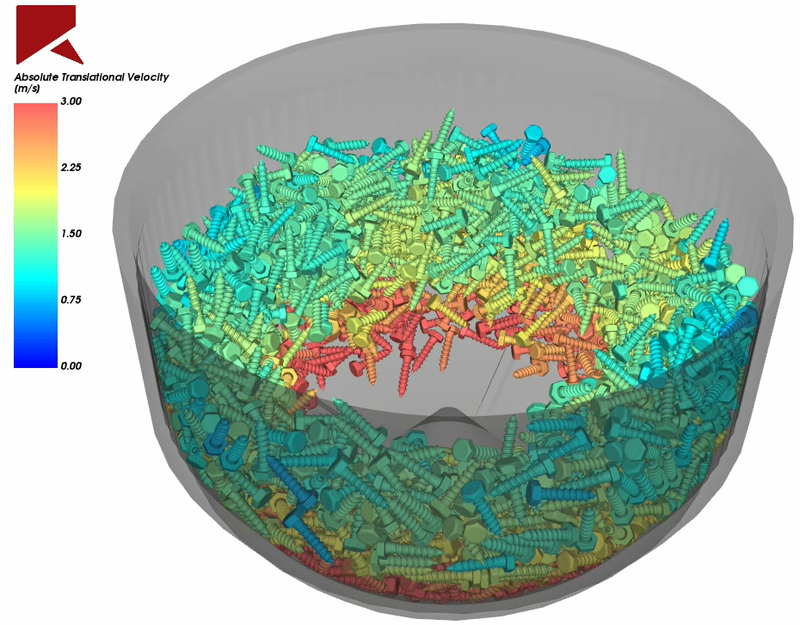 The latest version of Rocky DEM high-fidelity particulate software adds to and deepens modeling capabilities, including particle collision analysis, spring and damper motion, fiber modeling improvements, and ANSYS Workbench integrated fluid–particle simulation. Rocky DEM 4.2 predicts how collisions happen within a particle, adding more value to its collision energy spectra. Statistical information like duration, impact and shear allow designers to accurately estimate particle abrasion, edge chipping and damage — as well as how collisions affect the system. A relevant intra-particle collision application is polishing metal parts in a tumbling machine. 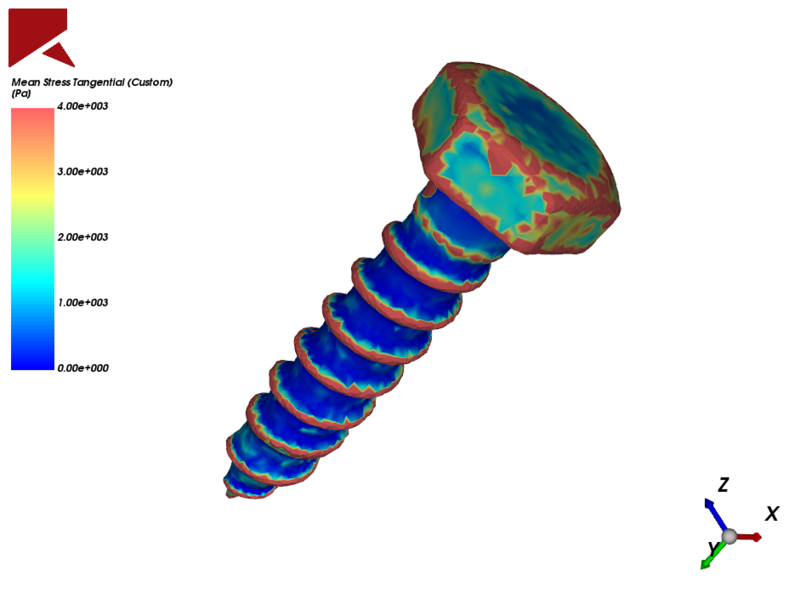 Each screw has 10k triangles on the surface representation, with 2k screws on the pan. The simulation run was designed to avoid artificial material softening. As you can see from the result of this stress test. Rocky’s motion body dynamics kernel incorporates spring and damper motion capabilities that enable broader simulation while simplifying configuration and post-processing. Users no longer need to couple with external motion-body dynamic software to simulate complete models like passive valves and gates, independent multi-wheel suspensions, damped actuators, and pre-tensioned systems. This storage silo application shows typical simulation results when using Rocky DEM’s Spring and Damper Motions for valve opening. Rocky 4.2 offers more-robust Workbench integration when coupling with ANSYS Fluent®. The project schematic shows on-the-fly simulation progress updates and robust multiple design-point projects, including CFD to DEM. The seamless ANSYS SpaceClaim–Rocky geometry-unit handling enables simulations on different scales inside the same project schematic. ANSYS Workbench project schematic showing Rocky DEM integration. The release expands the modeling range of real fibers and particles, and it further improves simulation speed. A new search algorithm speeds up packed-fiber system simulation by an average of two times, along with the ability to configure different elastic ratios for each fiber segment. The new release incorporates a number of other critical enhancements. For fluid–particle–thermal setups, Solid and Porous Media Domains provide tight coupling so particles move through and between multiple fluid domains when coupling with ANSYS Fluent. CFD Mesh Decomposition on multi-GPU ensures that the run is executed in parallel through a domain decomposition approach based on CFD mesh cells. Context Save/Restore functionality in Rocky 4.2 eliminates the customization needed to compare differences in multiple simulations. The new Particle Generation Preview provides immediate feedback of estimated number of particles to be released into the system, based on setup parameters. And Custom Output Control optimizes disk I/O and minimizes data storage issues so users can independently configure output frequency from simulation summary curves and particle results. To learn more about ROCKY DEM, contact us, Rocky Channel Partner.